Love Notions Sabrina Slims – finally made a pair of pants that fit! Let’s talk PANTS!!! Everyone needs a pair – why not make a pair that actually fits? The Sabrina Slims were inspired by the 1950’s ‘cigarette’ style pants most notably worn by Audrey Hepburn. The Love Notions take on this classic style features a wide, contoured waistband that sits just below the navel, a slim fit through the waist and hips and straight from the knees down. This is a slim-fit pant from waist to knee and then straight to ankle. They are close fitting but not leggings close if using the recommended fabric. The Sabrina Slims are meant to hit at the ankle but instructions are included to lengthen if desired. Also included are optional welt pockets and center front and back seaming to add interest and give the illusion of length. Petite, regular and tall inseams are included. Make the pants maternity by adding either the underbelly or the over belly waistband. I would say this description is pretty accurate. I usually have several adjustments I make to a pattern before I make a muslin, but pants are unfamiliar territory, so I proceeded with caution. With my short torso (I made no length adjustments to these pants as they were a wearable muslin, and I wanted to evaluate fit before making changes), the waistband actually does sit on my waist. The pattern recommends stable medium to heavyweight knits with at least 25% stretch (e.g. ponte, scuba, french terry, interlock and cotton/lycra) or medium weight wovens with at least 30% stretch (e.g. sateen, corduroy, twill, jacquard and denim). I would say the first challenge I met when tackling these pants in the past was fabric selection. I was using medium weight wovens with a “close enough” stretch %, and getting poor results. I also realize that with a child under 1, my dimensions were in greater fluctuation than I realized, and I was not remeasuring myself each time I whipped the pattern out. 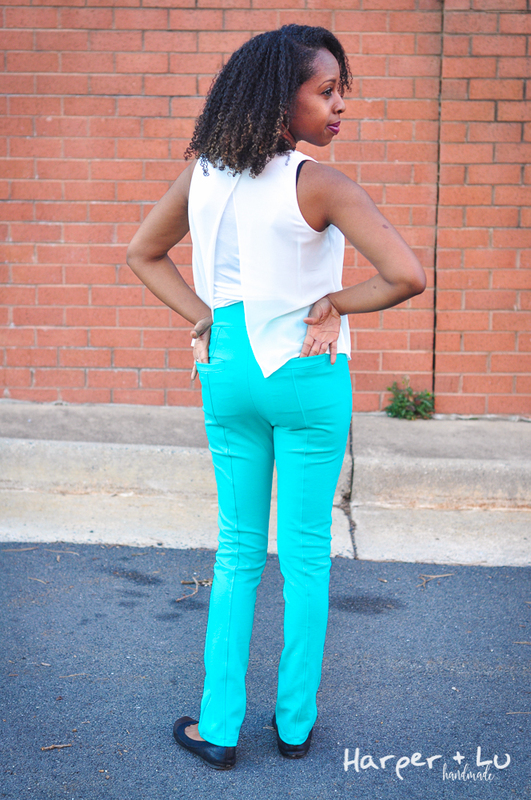 For this version, I used this seafoam ponte from So Sew English, and it has been a LIFESAVER! The owner contacted me when I was complaining about fabric choices for these pants and assured me this would work well – I was skeptical, but she couldn’t have been more right! A couple things I learned from this pattern: (1) the addition of thigh measurements is a LIFESAVER! I find that in fitting pants, my ‘thin’ thighs cause me all kinds of grief! It causes really awful creases under my bum that are terribly unflattering. In this pattern, I selected my main size by my hip measurement (size 2), and then graded down to a size 0 for the thighs and legs. I did not size up for my waist measurement (though I could have) – I just didn’t feel it was necessary. This pattern is finished with an elastic waist, which means the waistband should stretch over my hips to pull them on. I figured that while my waist is several inches larger than the measurement for a size 2, it is still smaller than my hips, so the waistband should fit (without grading it larger) – this worked out for me and would likely for anyone else in that boat. I opted to not add the elastic in the waistband on this version (since I used the ponte for the outside and the inside of the waistband, and I wanted these to be comfy); however, I think I will add them for the next version as I realize that the ponte does relax a bit over the day with wear. For this version, of course I selected the seamed leg with the welt pockets – I love a challenging sew relative to my skill level! I’m actually pretty pleased with how they came out, though I may stitch the pockets closed next time, or add a button… I think the fullness of my backside pulls them open more than I would like. You can see the cute little pocket lining detail I added – I really adore polka dots! Overall, these Sabrina Slims (affiliate link*) will be a pant that definitely gets wear through the spring and summer, and is a great add to my wardrobe! I am thrilled that I kept at it and already have a black version in the works. *This post contains affiliate links. If you click the link and make a purchase, I receive a very modest compensation that immediately goes towards more fabric and pattern purchases! These look amazing!!!! I haven’t made them but they are on my list. I need a suitable muslin fabric. EEEK!!! I KNEW THESE WERE GOING TO LOOK FABULOUS WHEN YOU WERE DONE!!! All the heart eyes, Mac! ALL! Do you think you need to shorten the pants overall length though? It seems pretty wearable at this original pattern length to me. But I do think the front crotch length could shorten a smidge. Probably take it out as a wedge starting from the side seams, so that you don’t shorten that outseam length? I really want to retry the Sabrina Slims now. Like you, I was using a stretch woven with enough stretch for my first 2 muslins and they ended horribly. I will have to take your suggestion and stick to some ponte and see how those work out. Flashing colour. They look great. Sew well fitted pants is quite a challenge. This style is great on you, Mac! I love the seaming on these! I’m a flat bottomed girl, so those kinds of lines are always helpful for me in doing adjustments to patterns. I’m with you on making pants during babies. I made my first pair of jeans just after my second son was born–and he was the one I gained 50# with (well, it probably was more, but I stopped counting at some point!). Predictably, maybe after 5 wears, I dropped 10 lbs. I kept those pants for a long long time and wore them in other pregnancies as maternity pants they were so big! Ha! Sometimes you sew for where you’re at. I really enjoyed reading this post. I have been on the fence over purchasing this pattern since it was first released. Having a hard time with a dress recently your blog is giving me renewed hope that these might fit better. Thanks for a great quick read and review! Love the pants!!! Need to add this pattern to my collection. The blouse is pretty, too–did you make it?